Some of you may have noticed (OK, one of you may have noticed) I have not made posts in a while. Don't worry, this blog is not going the way of the buffalo (or the way of the Buffaloes as it were). I have become a sporadic poster over at College Football by The Numbers. Here's my first post, a bowl preview. I will post previews of all the bowl games over there. Check them out if you're so inclined. In the offseason, I will continue posting at CFBT (probably about one post every week or two). However, this blog will remain active. Look for the annual SDPI recaps beginning in February followed by conference previews this summer and my weekly picks during next football season. As always, thanks for your readership and Merry Christmas! It was bound to happen eventually. For the first time in nearly two months the picks were less than accurate as your humble prognosticator endured a 3-6-1 week. Still, the overall mark is a somewhat healthy 66-60-4. We'll try to conclude the season on a high note. Home teams in Bold. Let this game serve as a Exhibit A for what can happen when you expand your conference and separate into divisions (and have two teams ineligible for the postseason). Wisconsin could sneak into the Rose Bowl with five losses if they happen to upset the Cornhuskers in this, the second-annual Big 10 Championship Game. Wisconsin won the first edition last season against Michigan State, and with Ohio State and Penn State both ineligible this season, were prohibitive favorites to return. The Badgers have returned, but with five regular season losses (tied for the most in the Bret Bielema era). While the losses have mounted in 2012, they have all been close. The Badgers have lost four games by exactly three points (including their first meeting with Nebraska in Lincoln) and another by seven in overtime. Despite the disparity in records, these teams seem about even. Don't be surprised if the Badgers leave Indianapolis with Roses in their mouths Saturday night. Last week, Pitt took a giant step toward bowl eligibility by pounding the current Big East front-runner, and by the time this game is played, potential Big East champion Rutgers by three touchdowns. Meanwhile, South Florida lost for the eighth time in their last nine games by 17 at Cincinnati. Easy play here right? Pitt in a snoozer. Before you double down on Pitt though, consider the Panthers have won just one road game all season (at Buffalo) and lost their last game as a road favorite three weeks ago versus Connecticut. The Panthers were in perfect position to take on Rutgers, coming off a bye. In addition, South Florida has been decent at home this season, posting a 2-3 record and covering in their lone game as a home underdog (versus Florida State). Pitt may well get their elusive sixth win here, but I think this game will be close. After their shocking win last week versus Louisville, the Connecticut Huskies seek to win their third straight game and get to bowl eligibility. Standing in their way is a Cincinnati team still technically alive for the Big East title. The Bearcats have just two league losses, and a win in Storrs coupled with a Louisville win over Rutgers would put them in a four-way tie at the top of the standings with Louisville, Rutgers, and Syracuse. The BCS bid would go to the highest ranked team in the BCS, so the Bearcats are out of luck there. Still, it would mark the second-consecutive shared title for the Bearcats (many may forget they finished tied with West Virginia and Louisville last season). Cincinnati is just 5-8-1 Against the Spread (ATS) on the road under head coach Butch Jones while the Connecticut Huskies are 3-0-1 ATS as a home underdog under head coach Paul Pasqualoni. Look for the Huskies to keep this one close as they fight to attain bowl eligibility. On this Championship Saturday, its fitting that this Sun Belt game is the de facto league championship. Both Middle Tennessee and Arkansas State enter this game sporting identical 6-1 league records. Middle Tennessee has won four straight overall and five straight in the league, while Arkansas State has rattled off six straight wins since losing their league-opener to Western Kentucky. The Blue Raiders from Middle Tennessee are looking for their first league crown since sharing the title with Troy in 2006. Arkansas State is looking to repeat as champions after finishing 8-0 to claim the title outright last season. Middle Tennessee State has been extremely solid on the road, going 5-1 (ATS), including 2-1 as an underdog, with the two covers resulting in straight up wins over Georgia Tech and Western Kentucky. Arkansas State has been less than stellar as a double-digit favorite, failing to cover in that role in both their games (versus Memphis and South Alabama) this season. Arkansas State should get their second consecutive league title, but Middle Tennessee will make them work for it. I can't think of a better way to end your first season as a IA program than in Honolulu. That is just what the Jaguars from South Alabama get to do on Saturday night, and they may also be able to leave the islands with a win. Last week notwithstanding, when they rolled up 48 points on UNLV, the Warriors have been punchless in Norm Chow's first season as coach. Prior to that outburst, the Warriors had been averaging 17 points per game against their fellow Mountain West conference foes. In addition, they were also pretty bad ATS, failing to cover in any of their three previous home games. South Alabama has been solid as a road underdog this season, covering four times in six games. Look for that trend to continue here as they hang with Hawaii and potentially leave with third win of the season. For the first time since 2003, and only the second time in the game's history, both MAC Championship Game participants enter ranked in the AP Poll. In fact, if things fall into place, the winner of this game could crash the BCS party (especially if that winner is Kent State). While the Golden Flashes are a great story, Northern Illinois appears to be the real class of the MAC. In MAC-play, the Huskies won all their games by at least seven points, covered the spread in seven of eight games, and posted the league's most explosive offense. Kent State was impressive as well, winning all but one of their eight games by seven points or more. However, the Golden Flashes played in the weaker of the two divisions and are playing in their first postseason game since 1972. Meanwhile, Northern Illinois is playing in their third straight MAC Championship Game and likely remembers the result from two seasons ago when they arrived as prohibitive favorites against a plucky upstart. Northern Illinois should win this game by double-digits. Like the Pac-12, Conference USA rewards its strongest team by giving them homefield advantage in the conference title game. In the seven seasons that Conference USA has staged a title game, the favorite has covered four times, and the home team has covered four times. Those are hardly dominant trends. 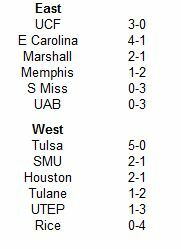 However, these teams played on the field just two weeks ago, with the result being a two-point win by the Golden Hurricane. Last week, in a rather meaningless game for Tulsa, they committed three turnovers and lost by eight to an SMU team fighting for their postseason lives. Meanwhile, Central Florida knew (after East Carolina's win on Friday) that they had to win to qualify for this game. They beat UAB by 25. With proper motivation, Tulsa is the better team. Plus they are playing at home, and need only win by a field goal to cover here. Give Baylor their due, as they have qualified for a third consecutive bowl game under Art Briles. That is quite an accomplishment for a team that went 16 years between bowl bids. Also give the Bears credit for knocking off an unbeaten Kansas State team at home two weeks ago, in one of the more memorable upsets of recent vintage. The Bears also won last week to get to that elusive six-win plateau. However, Texas Tech has been trending downward since bludgeoning West Virginia in mid-October. Since that game, the Red Raiders have lost four of six, with both wins coming in overtime, and have allowed a ghastly 492 yards per game. Oklahoma State has proven they remain a force to be reckoned with under Mike Gundy, even in a rebuilding year. The Cowboys have won seven games and are 5-2 ATS as a favorite this season. Oklahoma State should do enough to beat the Bears by at least a touchdown here. What mid-western team is about to lose their 21st straight conference game? That's right, the Kansas Jayhawks. While I don't trust West Virginia to play any semblance of defense here, I also don't believe Kansas will come close to stopping Geno Smith, Tavon Austin, and the rest of the West Virginia offense. Kansas has covered once all season on the road, and that came against a Texas Tech team that has imploded (though not as bad as last season) down the stretch. West Virginia may give up 30 here, but I have a hard time seeing them not coming close to 60 themselves. I have a hard time understanding the love Georgia has been getting of late. Since being waxed by South Carolina, the Bulldogs have won six straight, including an impressive win over Florida. However, of their six wins in that stretch, two came against SEC teams that failed to win a game in the conference (Kentucky and Auburn), one came against a IAA team (Georgia Southern), another came against a 6-6 SEC team (Ole Miss) , and the last one came against a 6-6 ACC team (Georgia Tech). On the other side, Alabama has faced a pair of tune-ups in preparation for this game, beating Western Carolina and Auburn by identical 49-0 scores since being upset by Texas A&M.. Alabama strikes me as the much better team, having allowed just ten offensive touchdowns in their eight SEC games. Georgia has a dynamic offense, but they will find the sledding rough against Alabama's elite defense. Plus Georgia's defense is a little suspect, allowing both Tennessee and South Carolina to crack the 30-point barrier against them. Look for the Crimson Tide to win by double-digits here. During the first ten weeks of the college football season, your humble prognosticator did not push a single game. In the past two weeks, we have pushed thrice. How about that? Week 12 was another successful week, as I managed a 5-4-1 mark, bringing the yearly tally to 63-54-3. That also means we have now gone seven consecutive weeks with at least a .500 mark. I guess what that means is, the bottom is due to fall out at any time. Proceed with caution. Home teams in Bold. This season has gotten away from Ohio. The Bobcats began the season 7-0, included among the seven wins was a victory over Penn State. In fact, the Bobcats rose as high as number 23 in the AP Poll in late-October. However, the Bobcats have now lost three of four and have already failed in their endeavor to return to the MAC Championship Game for the second-consecutive year and third time in the past four seasons. That first conference title since 1968 will have to wait for another year. Meanwhile, Kent State has surged under second-year head coach Darrell Hazell. The Golden Flashes have won nine consecutive games and have qualified for their first ever MAC Championship Game. Since beginning the 2011 season 1-6, the Flashes have won 14 of their past 16 games, including 11 of 12 within the conference. Still, there are reasons to like Ohio to cover the big number in this game. The Bobcats are 4-1 Against the Spread (ATS) as a double-digit road underdog since 2008, while Kent State is 0-2 ATS as a double-digit home favorite under Hazell. There is also the look-ahead factor as Kent State has already earned a spot in the MAC Championship Game and may not be fully motivated. Look for Ohio to keep this one within a touchdown. Its been a weird season for the Yellow Jackets. Georgia Tech began the season 2-4, with a home loss to Middle Tennessee State among the quartet of losses. The Yellow Jackets then pounded a poor Boston College team to improve to 3-4, but were subsequently manhandled the following week at home by BYU, in a game where they scored just one offensive touchdown and had their lowest yardage output (157 yards) since the Orange Bowl loss to Iowa to conclude the 2009 season. Since their home embarrassment to the Cougars, the Jackets have quietly won three straight to get to bowl-eligibility and will actually represent the Coastal Division in the ACC Championship Game thanks to Miami's self-imposed postseason ban. Still, in their six wins, the Jackets have beaten just one bowl-eligible team (Duke). That number doubles if we include the postseason-ineligible Tar Heels, but still that is hardly an impressive number. So why are they the pick here? Under Johnson, the Jackets are 9-5 ATS as a road underdog and 2-1 as a double-digit road underdog. They have also covered in both games under Johnson at Georgia, winning outright as a touchdown underdog in 2008, and losing by eight as a two-touchdown underdog in 2010. Meanwhile, Georgia is just 2-3 ATS as a double-digit home favorite this season and just 7-6 in such a role since 2009. And speaking of quality wins, Georgia has beaten just two bowl-eligible teams themselves (Vanderbilt and Florida), though Ole Miss could join that esteemed list if they beat Mississippi State this week. Georgia Tech should keep this one relatively close. This marks the first meeting of these two Division IA neophytes. Both teams will be moving to new conferences next season as the Texas-San Antonio Roadrunners will move to Conference USA and the Texas State Bobcats will move to the Sun Belt. Besides being newcomers to IA football and residing in the Lone Star State, both teams are also coached by men you may have heard of. The Roadrunners are led by former Miami head coach and national champion, Larry Coker. Meanwhile, the Bobcats are coached by noted Mrs. Doubtfire lookalike and former Alabama and Texas A&M coach Dennis Franchione. Both teams have been moderately competitive in their first foray into IA football. Texas State owns two wins over fellow IA programs, including a monumental upset in their first game against Houston. Texas-San Antonio has won thrice against IA teams, beating South Alabama, New Mexico State, and Idaho. In fact, in WAC play, the Roadrunners have gained more yards and allowed fewer yards than Texas State. They are also playing at home, so this spread should probably be about a field goal in the other direction. The Roadrunners should conclude their inaugural IA season with their eighth overall win. The Scarlet Knights continue their quixotic quest towards their first conference championship and BCS-bowl bid. Last week they upset Cincinnati on the road to improve to 5-0 in the conference. Win or lose here, their game next week at home against Louisville will likely determine the Big East champion. Rutgers boasts the best defense in the Big East and has allowed just four offensive touchdowns in their five conference games. The Knights also boast a solid track record on the road this season, winning in all three games as a road underdog (South Florida, Arkansas, and Cincinnati). The Pitt Panthers need wins in their final two games (versus Rutgers and next week at South Florida) to salvage a bowl game in Paul Chryst's first season as head coach. I don't think they will be able to come through against a stout Rutgers defense this weekend. Fortunately for Pitt, Chryst is likely to stick around and coach next season, marking the first time since 2010 they have had the same head coach for two consecutive seasons. On the surface, this game may not appear to have any far-reaching significance. However, it could be quite significant for the employment opportunities of Danny Hope, head coach at Purdue. Hope has guided the Boilermakers for four seasons and has posted just a 21-27 mark, including a 5-6 record this season. His lone bowl appearance came last year on the heels of a 6-6 regular season campaign. This game is also pretty significant for Indiana football. This game is not only for the Old Oaken Bucket, a trophy Indiana has won just twice in the past ten years, but it would also give the Hoosiers three conference wins for the first time since 2007, and just the third time in the past decade. The Hoosiers have been rather feisty in head coach Kevin Wilson's second season, posting a 4-3 ATS record as an underdog and a 3-2 ATS record on the road. Meanwhile, Purdue has hardly been a lock as a home favorite under Danny Hope, posting just a 4-8 ATS mark in such a role. In addition, the Boilermakers are just 1-3 ATS as a favorite this season. Look for Indiana to keep this one close and potentially keep their in-state rivals out of the postseason. Last week the Orange went on the road and won against an SEC opponent (Missouri) as a four-point underdog. The win got the Orange to the magical six-win threshold for the second time in three seasons and also represented their first win against an SEC opponent since September of 2001 when they beat Auburn at the Carrier Dome. Now the Orange will try to get to seven regular season wins against a Temple team also off an outright upset. The Owls were a slight two-point underdog last week against Army, but managed to roll up a season high 565 yards and 63 points against a very porous Army defense. The Black Knights rank 123rd out of 124 teams in yards per play allowed, permitting a nearly inconceivable 6.91 per snap. In their five previous games, during which they went 1-4, the Owls averaged 285 yards and 14.2 points per game, much more indicative of their actual skill level. In Big East play, Temple ranks dead last in both yards gained and yards allowed. Syracuse has a very potent offense, ranking second only to Louisville in the Big East, and a respectable defense. The Orange should win this one by about two touchdowns. This year's battle for the Territorial Cup involves a pair of teams enjoying moderate success under first-year head coaches. The Arizona Wildcats already have seven wins, and with a victory against their in-state rivals followed by another in their bowl game, would own nine wins for the first time since winning 12 in 1998. Mike Stoops never won more than eight in his eight seasons in Tucson. Arizona State is also bowl-eligible under Todd Graham, meaning both Arizona schools will head to the postseason for the first time since 1997! Arizona State has struggled on the road, winning only against the dregs of the conference (Cal and Colorado), while losing by double-digits to both Oregon State and Southern Cal. Meanwhile, Arizona is 6-1 at home, with their lone loss coming at the hands of Oregon State. The Wildcats have issues on defense, but should be able to move the ball well enough to win by about a touchdown. With the recent announcement that they will be forgoing a bowl for the second-consecutive season, this trip to Durham marks Miami's final game of the 2012 season. The Hurricanes have fared better than most thought in the preseason. With a win against the Blue Devils, the Hurricanes would technically be your 2012 Coastal Division champions. Unfortunately, the self-imposed postseason ban means the Hurricanes have already ceded their slot in the ACC Championship Game to Georgia Tech. Miami will try to finish the season on a solid note against a Duke team, that while bowl-eligible for the first time since Ini Kamoze was nationally relevant, is actually pretty horrible on defense. Miami is 4-0 ATS since 2010 as a single-digit road favorite and under Golden, the Hurricanes are a solid 6-2-1 ATS in all road games. Look for that trend to continue here as Miami easily tops 30 points, becoming the sixth straight team to score at least 30 against the Devils, and wins comfortably here. Is it time to jump off the Louisville bandwagon? After beginning the year 9-0, the Cardinals fell in relatively grisly fashion to Syracuse, and have now had a week to dwell on their first loss. The Cardinals remain in the top-20 of the latest poll, in fact they are the highest ranked team in the Big East. However, they are a virtual afterthought nationally. Still, with the Big East's automatic BCS bowl bid still well within their sights, motivation, or lack thereof should not be a problem in this game. Their opponent in this game, the Connecticut Huskies enter needing a win and a win next week against Cincinnati to return to the postseason for the first time under second-year head coach Paul Pasqualoni. The Huskies are also off a bye, having won two weeks ago against a Pitt team still obviously hung over after their close loss to Notre Dame. The Huskies have proven to have a solid defense, but they have real issues moving the ball, which could be a problem against a strong Louisville offense. It should also be noted that the Cardinals are 3-1 ATS as a double-digit favorite under head coach Charlie Strong. Conversely, the Huskies are 0-7-1 as a road underdog under Pasqualoni. Look for both those trends to continue here in a blowout Louisville win. Ball State head coach Pete Lembo has won wherever he has coached. Be it Lehigh, Elon, or Ball State, the man gets the job done. In 12 seasons as a head coach, his teams have posted just one losing season (his first at Elon in 2006). Lembo took over a Ball State team that had gone 6-18 in the two seasons prior to his arrival, matched that win total in his first year (6-6) and has the Cardinals standing at 8-3, riding a five-game winning streak. Lembo has done very well ATS in nearly all roles as head coach at Ball State. His teams are 2-1 ATS as road favorites, 9-3 ATS overall on the road, 6-1 ATS on the road in MAC play, and 10-5 ATS overall in the MAC. Ball State has an explosive offense and should be able to win this game by double-digits and get to nine regular season wins. After going ten weeks without a single push, we pushed twice on Saturday. On the whole though, it was a reasonably successful week, as I finished 5-3-2. The yearly mark is now 58-50-2. Perhaps most impressively, your humble prognosticator has now posted six consecutive non-losing weeks. Let's see if we can grab lucky number seven this week. Home teams in Bold. This tilt that may involve the eventual Big East champion has lost a bit of its luster over the last month as both of these teams have lost non-conference games to MAC opponents. Cincinnati lost at Toledo a little less than a month ago, while Rutgers lost the following week at home to Kent State. This game appears to be a clash of strengths. Cincinnati boasts one of the top offenses in the Big East (currently third behind Louisville and Syracuse), but on defense they rate ahead of only Temple. Meanwhile, Rutgers is below average on offense, but can lay claim to having the number one defense in the conference. This game will also mark the end of an Against the Spread (ATS) run for one of these teams. Rutgers is 2-0 as a road underdog this season, with outright wins at both South Florida and Arkansas earlier this year. Meanwhile, Cincinnati has covered in each of their three games as a home favorite (versus Pitt, Miami of Ohio, and Syracuse). Rutgers is a bit limited on offense, but against team's without great defenses, the Scarlet Knights have been able to move the ball (over 500 yards against Arkansas and over 400 yards against South Florida). Cincinnati may win this game and ease back into the league race, but Rutgers should match them step-for-step and keep this one close. If the Wildcats can hang on in either or both of those games, they are in the hunt for the Rose Bowl. As it stands, they are still bowl-eligible and have a shot to put a damper on the bowl designs of Michigan State. The Spartans are just 5-5 despite a strong defensive showing, thanks mostly to their general ineptness at offensive football. The Spartans have lost three games where they have allowed fewer than 20 points and have averaged just 18.8 points per game in Big 10 play. In addition, the Spartans are 0-5 ATS as a home favorite this season and just 4-7 ATS as a home conference favorite since 2009. Meanwhile, Northwestern is a solid 7-4 ATS as a road conference underdog since 2009. This one should be low-scoring and decided in the final minutes. Don't be surprised if Northwestern does enough to pull off the outright upset. Indiana is your consummate underrated underdog this week (CUU for short). The Hoosiers were embarrassed at home last week by Wisconsin 62-14 in a game where they were only a touchdown underdog. However, the Badgers have had Indiana's number the last three seasons. Including last week, the Hoosiers have lost to the Badgers by an average score of 14-68. And how have the Hoosiers done in their previous two road trips following the shellackings by Wisconsin? They have covered both times, winning outright as a field goal underdog at Purdue in 2010, and losing by 21 as a 23-point underdog to Iowa last season. In fact, if you limit your view to this season, Indiana has been very competitive. They are 4-2 ATS as an underdog and 2-1 ATS as a road underdog. Indiana will almost certainly lose this game, but I think the margin will be about two touchdowns. Is this the week? Can Kansas finally get their first conference win under the legendary (in his own mind) Charlie Weis and break an incredible 19-game conference losing streak? That's right, Kansas has not won a Big 12 game since beating Colorado with an avalanche of 35 fourth quarter points on November 6th, 2010. Since going 4-4 versus the Big 12 in 2008, Kansas is now just 2-30 in their last 32 conference games. That, my friends, is futility. However, Kansas has been reasonably competitive ATS during that span. Last season they were 2-2 ATS as a home dog versus Big 12 opponents, including nearly upsetting Baylor and eventual Heisman Trophy winner Robert Griffin. This season, Kansas has covered in each of their three games as a home underdog against Big 12 opponents, losing by 14 to TCU, by just six to Oklahoma State, and by four to Texas. The Jayhawks were also competitive last week on the road at Texas Tech, losing in OT by seven. Meanwhile Iowa State enters this game needing just one more win to qualify for their second consecutive bowl and third in the four-year tenure of Paul Rhoads. While Iowa State has won four Big 12 road games during his time in Ames, the Cyclones have only been road favorites against a Big 12 opponent once! They ended up losing that game by 20 points, and missed out on a bowl because of it. Iowa State is fighting for their bowl lives, but Kansas has been particularly feisty at home and has actually gained more yards and allowed fewer yards than the Cyclones in Big 12 play. Look for the long losing streak to end Saturday in Lawrence. Both these teams enter this late-season non-conference clash with 5-5 records. The winner will be bowl-eligible, and the loser will have just one more opportunity to qualify for a bowl game. Syracuse concludes their season with a visit to Temple, while Missouri finishes up with a road trip to Texas A&M. Thus, it would stand to reason that the Tigers need this game much more than the Orange. The Orange have quietly rebounded from a 1-3 start, and actually still have a remote (very remote) chance to walk away with the conference's Orange Bowl bid in their final season in the Big East. The Orange have moved the ball quite effectively of late, topping 500 yards of total offense thrice in the last four games behind senior quarterback Ryan Nassib and a pair of senior receivers in Marcus Sales and Alec Lemon. Conversely, Missouri has had trouble moving the ball all season, with their best offensive performance of the year coming last week against a pitiful Tennessee defense. Missouri is hardly a lock as a home favorite, going just 5-8 ATS since 2009 in that particular role. Look for this game to be very tight and don't be surprised if Syracuse leaves with an outright upset. Back in August, most Sun Belt aficionados (all four of them), probably would have pegged this spread to be Florida International -14 or so. And for good reason. The Panthers were coming off an 8-5 season and were prohibitive Sun Belt favorites. Their head coach, somewhat of a hot commodity in the offseason, had decided to remain in Miami and the future looked bright. Meanwhile, the Owls were coming off a 1-11 season and were bringing in a new, first-time head coach. Flash forward three months, and the Panthers are looking up at the Owls in the league standings. The Panthers won their first Sun Belt, and just their second overall, game two weeks ago against South Alabama. The Panthers have not fared much better ATS either. They are just 4-6 ATS overall and 1-5 ATS as a single-digit underdog. While the Owls have won just three times on the year themselves, they have been money against the spread, covering in eight consecutive games and going 8-1 ATS versus IA competition this year, including a perfect 2-0 ATS at home. Since both teams joined the Sun Belt in 2005, the Owls have won and covered in five of seven games. Look for that trend to continue here. This spread should be closer to a touchdown. In a week that features exactly zero clashes between top-10 teams and just two tilts between teams ranked in the top-25, this undercard deserves your attention. Plus it kicks off at Noon. So while the SEC is challenging themselves with some IAA squads, turn your attention to Conference USA. Both these teams enter the game with matching 6-0 conference marks, and the winner will clinch their respective division and earn a spot in the Conference USA Championship Game. While the loser will still likely qualify for the title game, the winner here will be assured of hosting a potential rematch on December 1st. Not only are both schools 6-0 in league play, they are also both 8-2 overall with the losses coming to BCS-conference opponents. Central Florida lost a relatively close game at undefeated Ohio State 31-16 and blew their chance for a program-defining win by losing at home to Missouri 21-16. Meanwhile Tulsa lost at Iowa State to open the season 38-23 and then fell at Arkansas two weeks ago 19-15. Both these teams are the best Conference USA has to offer this season. 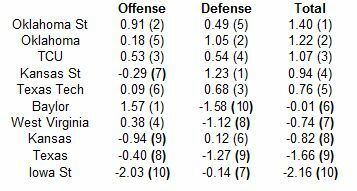 Tulsa is a little bit better on offense, while Central Florida is a little bit better on defense. Tulsa has a sterling home record under second-year head coach Bill Blankenship, losing only to Oklahoma State and Houston last season (two teams that combined for a 25-2 record). This one should be tight throughout, but the Golden Hurricane should manage to win by at least a field goal. While this may be the final season for the WAC as a football conference, the league has certainly not gone gentle into that good night. The league has three strong teams, with Louisiana Tech, San Jose State, and Utah State combining for a 25-5 mark. While Louisiana Tech has gotten the love from the pollsters (ranked 19th in the current AP Poll), one can make a plausible argument that Utah State is actually the better, and more complete team. There is no argument that the Aggies have the better defense. Over the course of the season, they have allowed two thousand (that's right 2000!) fewer yards than the Bulldogs. They have also held their own on offense too, averaging 6.65 yards per play (to Louisiana Tech's stellar 6.67). The Aggies are also on a stellar ATS streak, posting an 8-0-1 mark against IA competition this season, including a near-perfect 4-0-1 mark on the road. Louisiana Tech has not been as strong against the number, posting a 5-4-1 mark ATS and just a 1-2-1 mark at home. Utah State is one of the more underrated teams in the country and should win this one by about a touchdown and continue their great ATS streak. The Duke Blue Devils are 6-4 and eligible for their first bowl game since 1994. They are a great story, but they are not a good team. If we remove games against Florida International, Memphis, and NC Central, the Blue Devils have been outscored by about 14.3 points per game. And here's a newsflash, the Blue Devils play in the ACC. 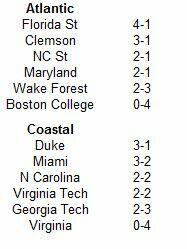 Outside of Florida State and Clemson, the ACC is very weak. In their last six games, the Blue Devils have allowed an average of 513 yards per game! That's not great news going on the road against an offense as prolific as Georgia Tech's. Duke is just 2-4 ATS as an underdog this season and an even weaker 1-3 ATS as a road underdog. Georgia Tech certainly has issues on defense themselves, but they should do enough to exorcize the Blue Devils by at least two touchdowns. Time to start a new streak. In their last home game, Wisconsin fell to Michigan State, their first home loss since October 17th, 2009 versus Iowa, snapping a 21-game home winning streak. The Badgers took out some of their anger on Indiana last week, crushing the Hoosiers 62-14. Now they get a chance to ruin Ohio State's dreams of an unbeaten season. While the Buckeyes have won all ten of their games, they have certainly not always looked great. They managed to sneak by an average at best Cal team at home by seven, won at Michigan State by a point, won at Indiana by three, and needed overtime to escape Purdue at home. Still, 10-0 is 10-0, even if it comes within the confines of the Big 10. Can the Buckeyes continue their run of success and leave Camp Randall Stadium victorious as they did in Terrelle Pryor's third career start in 2008? Well, since that loss to Iowa nearly over three years ago, Wisconsin has gone a stellar 12-6 ATS as a home favorite. The Badgers should be amped for this game after their heartbreaking loss to the Buckeyes a year ago (if you don't know about it, just check out the Watch ESPN commercial with the guy leaving the convenience store). Michigan State was able to beat the Badgers by shutting down their offense. Ohio State does not have that kind of defense (case in point, they gave up 49 points to Indiana). Look for Wisconsin to win by about a touchdown. For the second consecutive week your self-proclaimed prognosticenti posted a 5-5 mark. While we are disappointed with our showing, it did mark the fifth consecutive week we managed at least a .500 record. The tally for the year stands at 53-47. Home teams in Bold. After winning just one game last season, and going winless in the Sun Belt, the Owls from Florida Atlantic have already doubled last season's win total and captured their first conference win since early-November 2010. Very quietly this game is a matchup of the two best defenses in the Sun Belt. Western Kentucky is already bowl-eligible for the second-consecutive season and at 3-2 in league play has designs on their first championship as a IA team. 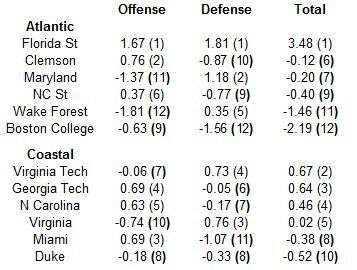 While Florida Atlantic will be home for the holidays for the fourth consecutive season, they have shown improvement, boasting the second best defense in the conference. In addition, the Owls have been rather spectacular Against the Spread (ATS) in Carl Pelini's first season at the helm. The Owls have been underdogs in each of their eight games versus IA opponents. However, the Owls have covered the spread seven times in those eight games, including a perfect 4-0 mark in games as a double-digit underdog. This one will be much closer than the three-score line. Last week, Air Force lost to Army for the first time since 2005 and in the process lost their two-year grip on the Commander in Chief Trophy (having lost to Navy earlier in the season). The Falcons were done in by five turnovers, their most since 2010, a span of 26 games. Meanwhile, San Diego State upset Boise State on the Smurf Turf, becoming the first team to win at Boise against the Broncos since...TCU last season. However, San Diego State was slightly outgained by the Broncos in that game and the winning margin was provided on a kickoff return touchdown. Air Force is a little undervalued here and San Diego State is a little overvalued. This spread should be closer to a field goal in San Diego State's favor. Don't be surprised if the Falcons pull off the outright upset here. After two down years where they posted just eight combined wins, the Oregon State Beavers have returned with a vengeance. The Beavers are currently 7-1 and still control their own destiny in their quest for their first Rose Bowl appearance since 1964. The Beavers visit Stanford this week in an elimination game in the Pac-12 North. Oregon State is an outstanding 18-8 ATS as an underdog since 2009, including an impressive 4-0 this season (with three of those covers coming on the road). Meanwhile, Stanford is just 1-3 ATS this season as a home favorite, narrowly surviving as relatively large home favorites against San Jose State and Arizona. Oregon State should cover here, and could leave with an outright upset. After covering for six consecutive games, the Florida Gators are in the midst of a two-game streak of failing to cover the spread. Could it be that those folks slow to warm up to the Gators are starting to overvalue them? The Gators are unbeaten ATS as an underdog this season, pulling three outright upsets against Texas A&M, Tennessee, and LSU. However, as a favorite, the Gators are just 3-3, with a late cover against Vanderbilt and a misleading 44-11 blowout against South Carolina. In addition, Florida is just 2-2 ATS since 2010 against mid-major foes. Meanwhile, Louisiana-Lafayette is 2-1 ATS versus BCS-conference opponents under head coach Mark Hudspeth and a robust 7-1 ATS as a road underdog. This game means nothing to Florida, so it would not surprise me to see the Gators come out very lethargic and win by about 24 points. UCLA is riding high off of their shocking 56-point beatdown of Arizona. Now they must travel to Pullman, Washington to face a team coming off a 43-point loss. This number is inflated a tad by both of those large margins last weekend. Washington State is actually a solid 5-2 ATS since 2010 as a double-digit home underdog. UCLA has already proven under their first-year head coach Jim Mora that they are prone to head-scratching road losses, falling 43-17 in Berkley against a mediocre at best Cal team last month. Look for the Cougars to make this one much closer than the experts think. One of the more pleasant surprises in the mid-major world has to be Fresno State. In 2011, the Bulldogs posted just their second losing season since 1998 and gave long-time coach Pat Hill a pink slip. The Bulldogs brought in Texas A&M defensive coordinator Tim DeRuyter and seemed likely to return to the postseason with 14 starters back. The Bulldogs have done much more than that. They are currently 7-3 with a shot at both their first ten-win season since 2001 and their first conference title since 1999. The Bulldogs' three losses have come on the road at Oregon, Tulsa, and Boise State, teams with a combined 23-4 record! ATS, Fresno has been even better, posting an incredible 8-1 mark, including a 4-1 mark on the road and a 6-0 mark as a favorite. Meanwhile, Nevada has dropped two straight after a 6-1 start. The Wolfpack do own a win over Cal from the Pac-12, but the Golden Bears have proven to be a rather middling BCS-conference team (currently have a 3-7 record). Nevada is 0-3 ATS at home this season, and just 2-6 overall. Fresno State could be the best team in the Mountain West and is one of the strongest mid-major teams this season. This spread should be closer to a touchdown. Has any bandwagon ever come to a screeching halt quite like the dual stagecoaches piloted by Dana Holgorsen? Six weeks into the season, West Virginia stood 5-0 and was ranked fifth in the nation. Quarterback Geno Smith had 24 touchdown passes and no interceptions and seemed ready to run away with the Heisman Trophy. Fast forward five weeks, and the Mountaineers have lost three consecutive games, with two coming at home, while being outscored by 77 points. Smith has thrown for a more modest five touchdowns and three interceptions the past three games and is no longer even in the Heisman conversation. Now the Mountaineers must travel to Stillwater to face an Oklahoma State team that is 13-7-1 ATS as a home favorite since 2009, and an even more impressive 7-1 ATS as a single digit home favorite. Oklahoma State is criminally undervalued. They actually outgained Kansas State last week and have won their last two home games by 21 and 22 points respectively. Look for more of the same against one of the worst defenses in college football. It's Dooley or Die time for Tennessee. The Vols have lost six consecutive SEC games dating back to last season and are just 1-12 versus conference foes since the start of 2011. If Dooley has designs on keeping his job, this is a game the Vols likely must win. The good news for Tennessee fans is that Missouri represents the softest conference competition they have faced this season. Tennessee has lost close games to Georgia, Mississippi State, and South Carolina (combined record 22-5) and been blown out by Alabama and Florida (combined record of 17-1). Missouri enters this game with a 4-5 record, and with only a single win on the road this season (at Central Florida). Tennessee is a little undervalued after their scare last week against Troy. The Trojans have a dynamic offense, while Missouri has struggled to move the ball all season, failing to generate more than 395 yards against any IA opponent. In addition, Tennessee is a solid 3-1 ATS as a single-digit home favorite under Dooley. Look for the Vols to get back on track as they outscore Missouri and win by at least a touchdown. The only underdog game I called correctly last week was Virginia against NC State. Now, I did not honestly believe the Cavaliers would win in Raleigh, but the ten-point spread was just too much to overlook. Now, after that big upset, the Cavaliers return home, knowing they must win out to make a second-consecutive postseason trip. The primary difference in last week's win and their previous quartet of ACC losses was ball security. Virginia committed just a single turnover last week against the Wolfpack after giving the ball away nine times in their previous four league games. Miami also won last week and is in the driver's seat for their first ever Coastal Divsion title. The Hurricanes beat Virginia Tech for the first time since 2008 and improved to 4-2 in the ACC. However, the Hurricanes were outgained in that game (as they have been in five of their six ACC contests). 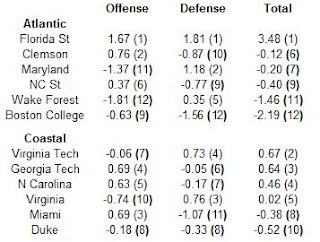 In fact, Miami has the second-worst defense in the ACC, besting only the boys from Durham in that category. Virginia has won two straight in this series and should do enough to keep their faint bowl hopes alive. Despite their loss at Georgia last week, Ole Miss still has a very good shot at becoming bowl-eligible in their first season of play under head coach Hugh Freeze. The Rebels need only win once in their final three games, against either Vandy, LSU, or Mississippi State. Similarly, Vanderbilt just needs a single win in their final three games (Ole Miss, Tennessee, or Wake Forest) to become bowl-eligible for the second-consecutive season under James Franklin. While both these teams have enjoyed solid seasons, Ole Miss has been better ATS, posting a 6-2 mark, including a 3-1 mark at home. For his career, head coach Hugh Freeze is now 15-4 ATS (9-2 last season at Arkansas State). His team's are also 6-1 as a home favorite. Vanderbilt has been decent on the road under James Franklin (4-5 ATS), but Hugh Freeze is a hard man to go against, especially at home laying just a field goal. The time has come for our final installment of SDPI. This week, we'll examine the two smallest conferences in IA football, the Big East and the WAC. For the WAC, this will be the conference's final season of football. Stay strong loyal WAC fans, and weep not for the memories. First the Big East standings. At the top of the standings, conventional wisdom seems to hold here. Louisville rates out as the best team in the conference and has a chance to run the table and finish 12-0. Cincinnati: The Bearcats need Louisville to lose twice or find some way to emerge from a three-way tie to claim the conference's auto-bid to a BCS bowl. With the worst defense in the conference, the Bearcats are more likely to lose one of their final four games than win out. Connecticut: The Huskies need to win out to get back to the postseason. While that is unlikely, the Huskies have proven to be quite strong defensively. The universe may be in the process of collecting from the Huskies after their run to the Fiesta Bowl in 2010. That season, Connecticut went 3-1 in one-score games en route to the Big East title. Since the 2010 season, the Huskies are just 4-8 in one-score games. Louisville: The proverbial fly in the ointment. Unfortunately, the Cardinals have virtually no chance to play for the national title even if they remain unbeaten. Pittsburgh: Sometimes you just never know. On opening weekend, Pitt lost at home to IAA Youngstown State by two touchdowns. This past weekend, they led a top-five Notre Dame team by 14 in the fourth quarter and missed a potential game-winning field goal in the second overtime before losing in the third frame. Rutgers: Their loss to Kent State removed them from the national conscience, but the Knights still control their own destiny in regards to winning their first ever conference title. South Florida: With their win over Connecticut, the Bulls snapped a six-game conference losing streak dating back to last season. However, the Bulls have still won only twice in their last 14 Big East games. Syracuse: After a 1-3 start, the Orange have a chance to get to their second bowl in three seasons. With their offensive firepower, they also have a shot to end Louisville's dream season at home this weekend. Temple: Life back in a BCS-conference has been tough for the Owls. They have the worst offense in the conference, but have already banked two league wins, their most in the Big East wince 2002. A third would give them their most in the conference since 1997. The WAC is clearly a two-team race between the Aggies of Utah State and the Bulldogs of Louisiana Tech. In its final season, the WAC has produced three solid mid-major teams, and four teams that rank among the worst in college football. Idaho: The Vandals were the first team in IA football to fire their coach in 2012. They have gone just 9-25 since winning an exciting Humanitarian Bowl in 2009. Louisiana Tech: The Bulldogs still have a remote chance at qualifying for a BCS bowl. Obviously, they need to win out, and pull against the Big 10. If they finish in the top-16 of the final BCS standings (currently 20th) and are ranked ahead of a champion from a BCS-qualifying conference, they will be headed for the big time. New Mexico State: After winning four games last season, and appearing moderately competitive, this season has to qualify as a disappointment. The Aggies have yet to beat a IA team and could go winless in the WAC. San Jose State: The Spartans have clinched their first winning season since 2006, and have an outside shot at winning ten games for the first time since 1987. Texas-San Antonio: The Roadrunners have been very competitive considering this is their first year of IA football and just their second season of football overall. They have already beaten a pair of IA teams (fellow IA newcomer South Alabama and New Mexico State) and with games remaining against Idaho and Texas State, have a shot at finishing .500 in the conference. Texas State: Like their newbie brethren in San Antonio, the Bobcats also have two IA wins in their inaugural season, including a mammoth upset of Houston in their IA debut. Utah State: The Aggies have a bye before their clash with Louisiana Tech on November 17th that should decide the WAC. Their two losses on the season have come by a combined five points (at Wisconsin and at BYU). They received just four votes in the latest AP Poll, and are one of the most underrated teams in the country. For the first time in the month of October, your humble prognosticator failed to post a winning record, finishing with a 5-5 mark. However, that is now four consecutive non-losing weeks. Lets see if we can keep the streak up. My overall record now stands at 48-42. Home teams in Bold. There are not many certainties in this life. Some will say death and taxes are certainties, but Elijah and Wesley Snipes may even quibble with those. Thus while nothing is ever certain, there are a few things we can count on. One of them is that teams coached by Hugh Freeze will cover the spread more often than not. Last season, as coach of Arkansas State, his Red Wolves went an amazing 9-2 Against the Spread (ATS) versus IA opponents. This season, his Rebels are 6-1 versus the number, bringing his cumulative ATS record to an outstanding 15-3! Now his Rebels travel to Athens to take on a Georgia team riding high after an upset of Florida. The Bulldogs have the inside track to the SEC Championship Game from the East, needing only to win at home against Ole Miss and at rapidly crumbling Auburn next week. While the Bulldogs are rightly favored against Ole Miss, Georgia has not done well in the role of heavy favorite this season, covering just once in five games as a double-digit favorite. I won't call for an outright upset, but the Bulldogs best be prepared for a competitive game against the Rebels. NC State is coming off a crushing loss to their arch-rival North Carolina. In that game, the Wolfpack led by double-digits in the fourth quarter, only to allow the winning touchdown via a punt return in the final seconds. Not only did the loss end their five-game winning streak against the Tar Heels, but they ceded control of the Atlantic Division back to Florida State. Meanwhile, Virginia comes into this game with an 0-4 league record, and an even uglier 0-7 mark ATS. That's right, Virginia has not covered the spread once this season! However, the Cavaliers are 4-3 ATS as double-digit underdogs under Mike London. I think Virginia is better than their record and they should get off the ATS snide this weekend. Michigan State kept their faint hopes of playing in the Rose Bowl alive last week by winning in Madison and breaking the Badgers 21-game home winning streak. The Spartans did what they have done all season and put a strangle hold on the opposing offense, limiting the Badgers to just 190 yards of total offense, their lowest output since at least 2006. Now they return home to face a Nebraska team that seized control of the Legends Division with their win last week against Michigan. Nebraska certainly did not win any style points, but they knocked out Denard Robinson and held the Wolverines to 188 total yards. Nebraska has been less than stellar on the road in their brief history in the Big 10. In six conference games, the Cornhuskers are 3-3 straight up and just 1-4-1 ATS. Look for Michigan State to pull the outright upset here and tighten up the division race. On this blog, I have picked against Kansas State three times, and each time Kansas State has covered. Keep that in mind if you pay any heed to my predictions. I like Oklahoma State to cover here for several reasons. 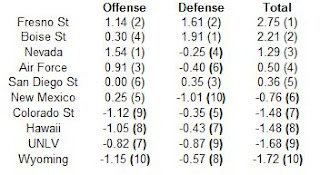 First, my SDPI numbers love the Cowboys and rate them as the best team in the Big 12. 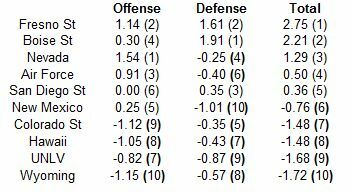 Secondly, Kansas State seems destined for a tight game, particularly against an offense as dynamic as Oklahoma State's. Think of the Cowboys like West Virginia with a much better defense. Finally, Oklahoma State has done very well as a road dog over the past few seasons, going 3-3 straight up and 4-2 ATS since 2008. This will be Kansas State's toughest test for the rest of the regular season (their other games are at TCU, at Baylor, and home versus Texas). As they are my second-favorite team outside of Wake Forest, I hope they win here, but methinks Mike 'Solomon' Gundy and his Cowboys have a real shot here. Very quietly, Bob Davie has turned New Mexico into a mediocre Mountain West team. That is quite impressive, considering the Lobos won just three games the previous three seasons (they already have four in 2012). The Lobos have also performed admirably against the spread, covering five times in their last six games, including three on the road. Perhaps ironically, UNLV has only been favored twice in the Bobby Hauck era, with both games coming against New Mexico. The Rebels covered in 2010, but lost outright and against the spread last season. Both teams are pretty bad defensively, but New Mexico partially makes up for it by having a strong ground game. This line should be closer to a pick-em, so take the Lobos getting the extra points. Last week, for the first time since their second game of the season, Penn State ended up on the losing end of a football game, falling to Ohio State 35-23. Perhaps more impressively, for the first time since their opening game against Ohio, the Nittany Lions failed to cover the spread. Now they travel to West Lafayette to face a Purdue team that is in the midst of a four-game losing streak. Three of the losses in that streak have come by at least 16 points, including last week's debacle at Minnesota. In that game, the Golden Gophers achieved their second largest margin of victory against a IA foe in the Jerry Kill era. Since starting Big 10 play, Purdue has been equally awful on both sides of the ball, ranking tenth in the twelve team league on offense and eleventh on defense. The Boilermakers have failed to cover in their previous two Big 10 home games, while Penn State has covered the number in each of their road games this season. This line should probably be over a touchdown. The only reason this line is not double-digits is because of the names on the respective helmets. If the resumes and roles in this game were reversed, Texas would be favored by two touchdowns. Texas has been absolutely atrocious on defense since Big 12 play began and has not covered the number in four consecutive games. Meanwhile, Texas Tech is vastly improved this season and would love nothing more than to stick it to their in-state 'big brother' when they get the chance. Don't look now, but Indiana is a home favorite against a conference opponent for the first time since 2007! They covered that day more than five years ago against Minnesota. I'm guessing if one had guessed the line for this game prior to the season, it would would have been in Iowa's favor by at least a touchdown. As it stands, the Hawkeyes have disappointed with a 4-4 record, while the Hoosiers have overachieved with a 3-5 mark (after winning just once last season). In addition, four of their five losses have come by a combined ten points. With a little better luck, the Hoosiers could be looking at a postseason trip. As it stands, they must win three of their final four to have any shot at a bowl game. Indiana has covered their two previous Big 10 home games this season and with an improved offense should be able to beat Iowa by at least a field goal. Western Michigan began the year with dreams of a MAC championship. And while the Broncos did beat Connecticut for the second consecutive year in the non-conference, their 1-4 MAC record has them out of contention. However, their four MAC losses have come against teams with a combined 29-6 overall record and a sterling 17-2 league mark (Ball State, Kent State, Northern Illinois, and Toledo). The Broncos get a reprieve with their last three games coming against Central Michigan, Buffalo, and Eastern Michigan, teams with a combined 5-19 overall record and 1-11 mark in the MAC. Central Michigan is a lackluster 5-15 ATS under head coach Dan Enos against MAC opponents, including 3-7 at home. Western Michigan should get back on the right track and stay in bowl contention with a win in Mount Pleasant. Iowa State has a reputation for being giant killers under head coach Paul Rhoads, and they certainly are. His Cyclones have won thrice as huge underdogs (at Nebraska in 2009, at Texas in 2010, and versus Oklahoma State last year). They have also won three games this season as slightly smaller underdogs. However, what is often missed is that the Cyclones under Rhoads have enjoyed a great deal of their success on the road. Two of their massive upsets occurred away from Ames and this season, two of their outright upset wins have come at Iowa and at TCU. As a home underdog, the Cyclones have gone a pedestrian 7-6 ATS under Rhoads. Iowa State is a solid team, but Oklahoma will enter this game with a chip on their shoulder after having lost at home for the second time at home this season last week against Notre Dame. I think this one may get ugly. Its time for our third installment of SDPI. Last week, among other things, I told you to be wary of large Big 12 favorites that were likely overrated, and lo and behold Texas and Oklahoma were challenged despite being heavy favorites. 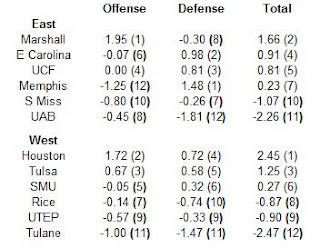 Of course, I also told you that Memphis had one of the better defenses on Conference USA. This week, we'll see what the numbers tell us about the Mountain West and Sun Belt. Next week, we'll finally get to the Big East and WAC. 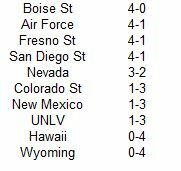 First the Mountain West standings. The numbers love Fresno State, and while the Broncos did beat them on the Smurf Turf, you have to be impressed with Tim DeRuyter's success in his first season in the valley. Air Force: The Falcons have to be kicking themselves for their loss to UNLV. Otherwise, with a schedule devoid of Boise State, they could be in position for their first conference title since 1998. Boise State: Despite their offensive reputation, the Broncos continue to make their hay with the best and most consistent mid-major defense. Colorado State: The Jim McElwain era began with a win over in-state rival Colorado. Unfortunately, the Rams went eight weeks before their next win, on Saturday against Hawaii. Fresno State: If the Bulldogs can survive a trip to Reno on November 10th, they have a chance to enter the postseason with an opportunity to win ten games for the first time since 2001, when another Carr was quarterbacking the team. Hawaii: The Warriors have been an absolute disaster in their first season under Norm Chow. Unfortunately, Boise State, Fresno State, and Air Force are still on the schedule. At 1-6, the Warriors could lose ten games for the first time since 1998. Nevada: Two weeks ago, the Wolfpack was 3-0 in the conference and looking forward to hosting Boise on December 1st with the conference title on the line. Now after two straight losses, and with Fresno and Boise remaining on the schedule, they could end the regular-season on a five-game skid. New Mexico: The Lobos won three games from 2009-2011. They have won four thus far in 2012, and have an outside shot at becoming bowl-eligible. Check out junior running back Kasey Carrier. He has four consecutive 100-yard rushing games, including a 338 yard performance versus Air Force. San Diego State: Rocky Long lied to us! After contemplating going for it on fourth down often during the offseason, the Aztecs have have just 14 fourth down conversion attempts which is tied for 46th nationally. UNLV: The Rebels have beaten Air Force, but no one else. They are currently 5-29 under head coach Bobby Hauck. During his seven seasons as head coach of Montana (a IAA power), his teams lost 17 total games. Wyoming: The Cowboys have an interesting on-again, off-again relationship with lady luck under head coach Dave Christensen. In odd-numbered years, Christensen's first season of 2009 and then last season, the Cowboys are a perfect 11-0 in one-score games. In even-numbered years, the Cowboys are 3-7 in one-score games, including a 1-4 mark this season. In other words, folks in Laramie should wait until next year to buy that lottery ticket. Now the Sun Belt standings. A familiar team is at the top of the Sun Belt ratings, but not the standings. That honor belongs to the team that was the toast of September. Arkansas State: The Red Wolves were due for some regression after their perfect Sun Belt campaign last year, but halfway home they remain contenders. Florida Atlantic: Congrats to the Owls who broke a 14-game Sun Belt losing streak with their upset win over Troy on Saturday. It was their first win against a IA opponent under first-year coach Carl Pelini. Don't look now, but the former Nebraska defensive coordinator has the Owls playing pretty well on that side of the ball. Florida International: They came in as heavy favorites to win the conference, and here we are almost in November, and they have zero conference wins. Sometimes you just never know. Louisiana-Lafayette: The Ragin' Cajuns have experienced some adversity, particularly on defense, where they rank last in the conference, but they have four wins banked and need just two more to become bowl-eligible for the sixth time in the last eight seasons. Louisiana-Monroe: If you forgot about them after their September hit and pair of near misses, you'll be happy to know they have won five in a row. Middle Tennessee State: Another reason you never know. The Blue Raiders have somehow managed to lose to a IAA team (McNeese State) at home, and beat an ACC team (Georgia Tech) on the road. North Texas: The Mean Green have won six conference games in a year and a half under coach Dan McCarney. In four seasons under his predecessor, Todd Dodge, the Mean Green won five conference games. South Alabama: Welcome to IA football! The Jaguars rate out as the worst team in the conference, but already have a conference win banked. Troy: They rate out as the best team in the conference, but with three league losses, they have virtually no shot at the title. Plus with games left against Tennessee and Navy, they may not get to bowl-eligibility either. 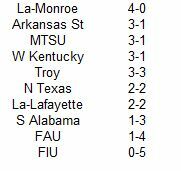 Western Kentucky: Standing at 6-2 with four games remaining, the Hilltoppers (along with the Warhawks of Louisiana-Monroe) have a shot at winning ten games in the regular season. That would be quite an achievement for a team that was winless in 2009. For the third straight week I enjoyed a fine weekend of prognostication, finishing 8-2 to push back over .500 for the year at 43-37. We'll see if the clairvoyance can continue. Home teams in Bold. Last Thursday night, SMU enjoyed one of the more misleading 72 point games you will ever see. In their 30-point win over in-state rival Houston, the Mustangs forced an amazing nine turnovers and scored four defensive touchdowns (three interception returns and a fumble return). It marked the second time this season SMU has forced at least nine turnovers (they forced ten in their 52-0 win over Stephen F Austin). The victory over Houston came just five days after a perplexing road loss to Tulane and moved the Mustangs back into contention in the West Division. The Mustangs continue their quest for a bowl game hosting a Memphis team that has not improved record-wise from their lackluster performance the past three seasons (6-37 record since 2009). However, the Tigers have shown progress on a down-to-down basis, posting one of the better defenses in Conference USA. SMU is just 2-8-1 Against the Spread (ATS) under June Jones as a double-digit favorite (just 1-6-1 at home) and just 11-15-1 ATS against conference foes since the beginning of the 2009 season. Memphis may not be able to break through and get the win, but they should be able to stay within three touchdowns. It may have taken a half-season before this became evident, but Texas has not returned to elite status this year. While they performed well in the non-conference, covering twice in three games as double-digit favorites, they have struggled against Big 12 competition. They narrowly won (and covered) at Oklahoma State on a late touchdown that may not have been a touchdown. They were then upset by West Virginia at home, crushed by Oklahoma at the state fair, and narrowly avoided a third straight loss to Baylor. They are actually extremely fortunate to not be winless in Big 12 play, as they have the second-worst defense in the Big 12, outclassing only Baylor. Kansas has not improved substantially under first-year coach Charlie Weis, but the Jayhawks have already covered twice as huge home underdogs against TCU and Oklahoma State. Look for the Jayhawks to keep this one much closer than Texas fans would like. The Trojans from Southern California have been rather shaky as a road/neutral site favorite under Lane Kiffin, posting just a 4-7 mark ATS, including an 0-4 mark this season. Meanwhile, under new coach Rich Rodriguez, Arizona has already covered twice as a betting underdog, at home against Oklahoma State in an outright upset and on the road at Stanford in an overtime loss. Rodriguez should feel an eerie similarity between this team and his final Michigan squad, as Arizona is fantastic on offense (549 yards per game ranks sixth nationally) and atrocious on defense (465 yards per game ranks 107th nationally). Still, Southern Cal's road struggles (at least against the number), coupled with Arizona's offensive prowess mean this is a game the Trojans may actually lose outright. Kansas State has been one of the most surprising teams in college football over the past two seasons. The Wildcats have won 17 of 20 games despite being underdogs in eleven of those contests! However, the Wildcats have not worn the mantle of favorites quite as well, going just 4-3 ATS against IA opponents in that span. They host a Texas Tech team this Saturday coached by a man with a penchant for upsetting top-10 teams. In less than three full seasons at the helm, Tommy Tuberville has guided the Red Raiders to outright victories over top-10 teams twice and over top-20 opponents three times. The Red Raiders also catch the Wildcats off of a resounding road win over a flawed West Virginia team meaning the public at large is likely over-valuing them and inflating this number. Look for Texas Tech and their improved defense to keep this one very close. As I stated earlier this week in my mid-season SDPI post on the Big 12, I think Oklahoma's offense is overrated thanks to their bludgeoning of Texas two weeks ago. The Longhorns have the second-worst defense in the Big 12 (they can thank Baylor later) and the Sooners rolled up 677 yards and 63 points against them in Dallas. However, in their other three conference games, the Sooners have only averaged 391 yards. That's an impressive number, but hardly dominating by Big 12 standards. In Norman on Saturday night, they will face the strongest defense on their schedule (regular season variety) in the Irish from South Bend. Notre Dame has not allowed more than 17 points or 348 yards to any team this season. In fact, they have held their last six opponents under 300 yards. Oklahoma has already lost twice in Norman in their past six home games, after winning 39 straight at home from 2005-2011. I don't think they will lose twice at home this season, but methinks this one will be extremely tight. Ball State is just one win away from attaining bowl-eligibility for the second straight year under coach Pete Lembo. More than likely, he'll be heading up a BCS-conference team near you very soon. In the interim, the Cardinals travel to West Point to take on an Army team that features one of the worst defenses in college football. The Black Knights rank 108th in the nation in total defense, allowing 466 yards per game. However, that number does not do their defense justice. Owing to their offensive style featuring mostly runs that chew up the clock and limit possessions, it is actually worse. The Black Knights are allowing an amazing 7.50 yards per play, the worst in the nation by nearly half a yard. Things aren't likely to get any better this weekend, as Ball State comes in ranked 19th nationally in total offense, averaging 481 yards per game. This game should be entertaining and high-scoring, but Ball State should win by about a touchdown. The Blazers from UAB enter this game seeking their first win against a IA opponent under first-year coach Garrick McGee. While the Blazers have yet to break through in the win column (their lone win came against IAA Southeastern Louisiana), they have been more competitive, losing one-score games to Tulsa and east Carolina, while losing by only two touchdowns in Columbus against the Ohio State Buckeyes. Meanwhile, Tulane has entered the IA win column under their first-year head coach, Curtis Johnson, upsetting SMU in the Superdome two weeks ago. That win marked their first home cover against a Conference USA opponent since late-2010. In fact, since 2009, the Green Wave are just 3-10 against conference opponents in the Superdome. Look for that trend to continue here with UAB winning by at least a touchdown. The Rams and Warriors enter this game with a combined record of 2-11. Colorado State owns the only win over a IA opponent (Colorado), but makes up for it by also owning a loss to a IAA opponent (North Dakota State). In fairness to the Warriors from Hawaii, they did roll over their IAA opponent, Lamar, 54-2. Still, against IA opponents, Hawaii has yet to cover the spread this season, their first under head coach Norm Chow. In fact, in their previous three road games, Hawaii has been outscored 148-24. Colorado State is far from a good team, hell competent may be giving them too much credit, but the Warriors have been nothing but atrocious this season, and I wouldn't trust them even getting ten points in this spot. Florida continued their hot streak last week, roaring by South Carolina thanks to a barrage of Gamecock turnovers in the first half. Since failing to cover in their opener versus Bowling Green, the Gators have now covered the number in six consecutive games. Meanwhile, Georgia failed to cover for the third consecutive week as huge favorites at Kentucky. Georgia actually won and covered as a slight favorite in this game last season, but the Gators had won and covered the previous three meetings. Georgia has too many issues particularly on defense (allowed 870 yards to Tennessee and South Carolina while the Gators allowed 531 yards to those same two teams) to win here. Florida should win by at least ten points. The Houston Cougars head into this game against their in-state brethren from El Paso off a 30-point loss to SMU. However, as mentioned earlier in this post, the Cougars were done in by an amazing nine turnovers and four defensive touchdowns. That game was also on the road, whereas this one will be in the friendly confines of Robertson Stadium. Since 2009, the Houston Cougars are a robust 12-4 ATS as a home favorite, including a resounding 30-point defeat of UTEP in their last visit. Houston still has designs on the Conference USA West division, so motivation should not be a concern here. Look for the Cougars to bury the Miners in a barrage of points. It's now time for our second rendition of the mid-season SDPI ratings. Last week I clued you in on a number of things, including the fact that Arizona State might be the best team in the Pac-12. Thankfully I qualified that with a comment on their strength of schedule (or lack there of) as they were eviscerated at home by Oregon on Thursday night. This week, we'll take a gander at the ACC, Big 10, Big 12, and Conference USA. It looks like 1990's in the ACC. Florida State appears head and shoulders above the rest of the conference. And despite rumors of their demise plus two losses in the conference by mid-October, it appears a familiar face is poised to win the Coastal Division yet again. Boston College: Frank Spaziani is as good as gone. It's not a foregone conclusion that the Eagles lose the rest of their games, but they will likely be underdogs in all five. Clemson: Tigers still have issues on defense despite the stellar recruiting classes and the addition of coordinator Brent Venables. Duke: Congrats to the Blue Devils who are now bowl-eligible for the first time since the 1994 season. Georgia Tech. The defense looked much better in their first game since canning Al Groh. Of course, the competition was Boston College so let's withhold judgement for a few weeks. Florida State: There are probably too many teams in front of them to pass to get back into national title discussions, but rest assured Florida State is an elite team. At the very least, they may have a shot to ruin their arch-rivals perfect season on November 24th in Tallahassee. Maryland: The Terps have played seven games, and each one has been decided by 10 points or less. Miami: Their last three games conference games are all against Coastal Division foes, so the Hurricanes control their destiny in regards to reaching the ACC Championship Game. North Carolina: If you're into this kind of thing, the Heels are 3-0 Against the Spread (ATS) at home and 0-4 ATS on the road. They host NC State this weekend FYI. NC State: With a win over Florida State in their back pocket, the Wolfpack actually control their own destiny in the Atlantic Division. Virginia: The SDPI numbers actually like the Cavaliers. Unfortunately, their -7 turnover margin in conference play has kept them winless. Don't be surprised of they pull off an upset or two in their final four games, especially the home contests against Miami and North Carolina. Virginia Tech: Very quietly, the defense has improved since their humbling trip to Chapel Hill, culminating with last week's showing against Clemson when they held the Tigers to 295 yards, their lowest offensive output of the season. Wake Forest: There have been good (the home win over North Carolina), there have been bad (the 52-0 shutout at the hands of Florida State), and there have been ugly (the 16-10 snoozer win over Virginia), but Jim Grobe has the Deacons in familiar territory, in bowl contention. The Deacons will need to beat Boston College at home and steal a win as a likely underdog in Winston versus Clemson or Vanderbilt or on the road at NC State or Notre Dame. Now the Big 10 standings. The best team in the conference may be one that is ineligible for the postseason. However, it may not be the one that is currently undefeated. Indiana: Speaking of losing streaks, the Hoosiers have lost eleven consecutive conference games and 23 of 24. However, they have shown improvement, at least on the offensive end, under second-year coach Kevin Wilson. Iowa: Despite the blowout home loss to Penn State, the Hawkeyes still control their own destiny in the Legends Division. Michigan: SDPI says they have the number one defense in the conference. Of course, they have thus far faced teams that rank last, second-to-last, and eighth in the conference on offense. We'll see how well they hold up in Lincoln this weekend. 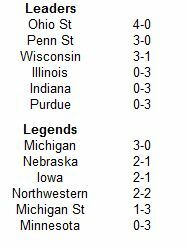 Michigan State: Barring a miracle, the Spartans are out of the running for the Legends Division with three losses. However, their losses have come by one, two, and three points, so they remain a dangerous spoiler over their final four games. Minnesota: The Gophers need to find two wins over their final five games to get to a bowl for the first time since 2009. The most likely candidates? This week at home against Purdue and on November 10th at Illinois. Nebraska: The SDPI numbers like them, but their conference wins have come by one and three points, while their loss came by 25. Northwestern: Congrats to Northwestern which is now bowl-eligible for the sixth consecutive season. If they had held on against Nebraska, they could have fancied themselves contenders in the Legends Division for at least one more week. Their offensive numbers are probably a little overrated as 46% of their total offense in four Big 10 games came in the opener against Indiana when they rolled up 704 yards and looked like the second coming of 1995 Nebraska. Ohio State: The Buckeyes slip by another flawed Big Ten team. Still, a win is a win, and they are halfway home to an unbeaten conference season. Penn State: Bill O'Brien has done a masterful job, not only of rallying his team after an 0-2 start with nothing of consequence to play for, but of turning Matt McGloin into a bonafide DI quarterback. In his first two seasons as a starting quarterback McGloin completed 54.% of his passes while throwing 22 touchdowns and 14 interceptions. The Nittany Lions averaged 23.5 points in games during which McGloin enjoyed significant playing time. Through seven games in 2012, McGloin has completed 62.5% of his passes with 14 touchdowns and just two interceptions. The Lions have averaged 28.6 points per game, while topping 30 four of the past five games. Purdue: After a solid 3-1 non-conference campaign, including a close loss to Notre Dame, you would be forgiven for talking yourself into Purdue as a Leaders Division contender. Meh, not so much. 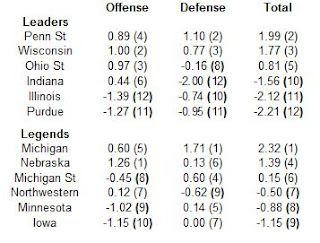 The Boilers rate out as the second-worst offense and defense in Big 10 and desperately need this weekends game against Minnesota if they want to return to the postseason. Wisconsin: Has the old Wisconsin returned? The Badgers have bludgeoned three straight Big 10 opponents rolling up 977 yards on the ground in those games. Keep in mind though those games were against Illinois, Purdue, and Minnesota. We'll know if their offense has found its footing after they face a still stout Michigan State defense this weekend. At worst, they have pretty much already locked up the Leaders Division thanks to the postseason ban in Columbus and State College. Onto the Big 12 standings. Looks like we're in for one heckuva a conference race. Fully half of the conference has an SDPI rating approaching one standard deviation above average. If Kansas State runs the table, they will have survived the deepest conference, top-to-bottom, in college football. 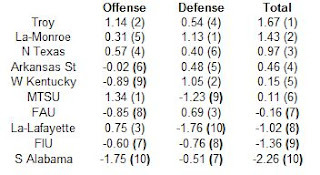 Baylor: The best offense and worst defense in the conference. The Bears have already lost two games in which they gained a combined 1307 yards and scored 113 points. Iowa State: The Big 12 is not a good conference to be sans an offense. When they aren't drastically winning the turnover margin, as they were against TCU (+5 in the upset win), the Cyclones have a very hard time scoring. The home game against Baylor this weekend is huge for their bowl aspirations. Kansas: The numbers like them better than I would have thought. The Jayhawks have played their first two home conference opponents tough (lost by 14 to TCU and by 6 to Oklahoma State). Maybe Texas has something to worry about this weekend. 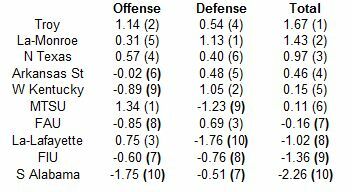 Kansas State: A year after winning games despite weak numbers on both sides of the ball, the Wildcats have great defensive and decent offensive SDPI numbers. I think SDPI is overrating their defense and underrating their offense thanks to their pace. The Wildcats have run just 441 plays in seven games (63 per game) which ranks 120th (out of 124 teams) in the country. Meanwhile, their defense has faced 475 plays (67.9 per game). Only 29 defenses have faced fewer plays. They have already won three conference games on the road meaning three of their last five are at home. Can Bill Snyder finally get the Wildcats to the national championship game after coming oh so close in 1998? Oklahoma: I think their performance against Texas may have fooled the nation into thinking their offense is elite. Outside of that outburst, the Sooners have averaged 391 yards in their other three conference games. That number would rank just eighth in the Big 12. Keep that in mind if you have the urge to take Oklahoma laying a large number against Notre Dame this weekend. Oklahoma State: The turnover-fest in the desert, and the close loss to Texas have removed them from the national conscience, but the Cowboys are still a very dangerous team. Texas: Last season, Texas gave up 24 offensive touchdowns in Big 12 play (in nine games) and allowed 334 yards per conference game. This season, through four games, Texas has already given up 24 offensive touchdowns and are allowing 580 yards per game to their Big 12 opponents. I will be shocked if Manny Diaz is coordinating the defense next season. TCU: In their final four seasons in the Mountain West, the Horned Frogs lost one conference game. They have lost two of their first four Big 12 games. 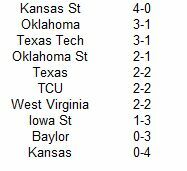 TCU is still a good team, but the Big 12 has a ton of depth and after Saturday, either them or the Cowboys will have three total losses. Texas Tech: The defense is light years ahead of where it was last season. The Red Raiders have a chance to shake up the BCS standings for the second straight year by winning on the road against a Big 12 power this week when they travel to Manhattan, Kansas. West Virginia: A great deal of their offensive notoriety can probably be explained by the fact that they opened conference play against Baylor and Texas, the two worst defenses in the conference. Finally, the Conference USA standings. An old familiar face tops the SDPI ratings, if not the actual conference standings. East Carolina: The Pirates have already banked four league wins, but with their loss to UCF, will need help if they play to return to the Conference USA Championship Game for the first time since 2009. Houston: How can a team that just lost to a division rival by 30 somehow rate as the best team in the conference by a wide margin? Turnovers. Houston outgained SMU by nearly 180 yards, but committed nine turnovers. The Cougars are very much alive in the West Division. Marshall: The Thundering Herd boast the best offense in Conference USA. They have scored at least 38 points in their first three conference games and have topped 50 in two. Set your DVRs when they host Houston on November 17th when the league's two best offenses get together. Memphis: The Tigers have shown some teeth on defense under first-year coach Justin Fuente. Are they the best defense in Conference USA? Probably not, but after just five total wins in the preceding three seasons, its all about minor victories. Rice: Oh, what might have been. The Owls knocked off Kansas early in the season, but have lost three of their four conference games by 11 total points, likely dooming them to a fourth straight losing season. SMU: The Mustangs rebounded from an inexplicable loss at Tulane to get back in the West Division race with a blowout win over Houston. Despite not even being assured of a bowl bid yet with a 3-4 overall record, they control their own destiny in getting to the Conference USA Championship Game. Southern Miss: After winning the conference and 12 games in 2011, the 2012 season can't end fast enough. The Golden Eagles are 0-7 and have clinched their first losing season since 1993. Just a note, Ellis Johnson was 17-28 as a head coach before he got his hands on what was a solid mid-major program. Bad hire anyone? Tulane: The Green Wave have played better as of late, upsetting SMU two weeks ago and losing to UTEP by four last weekend. Tulsa: The Golden Hurricane have not been dominating, but they are 5-0 in the conference and at 7-1 overall, are the league's only hope of sending a team into the polls. They have a bye this weekend before traveling to Arkansas While they will certainly be underdogs in that game, they have to like their chances now much more than they did in the summer. UAB: The Blazers are seeking their first conference win under first-year coach Garrick McGee. UCF: The Knights have the inside track to the East Division title, and their game with Marshall this weekend will go a long way toward deciding the division race. UTEP: The Miners continue their mediocre to-below average play under Mike Price. After taking the Miners to surprise consecutive bowls in 2004 and 2005, the Miners are just 18-34 versus conference opponents since. I think its time for a change.